Last month, Warner Bros. set nine release dates for upcoming DC Comics movies, although none of the titles were announced. Variety reports that one of those projects is Suicide Squad, with the studio eyeing David Ayer (End of Watch; Fury) to direct. It isn't known where the studio and director are at in the dealmaking process, but sources reveal that Warner Bros. believes David Ayer is a good fit for the project, which is described as being "dark and edgy." The original DC comic book centered on a number of supervillains who are given a chance to redeem themselves by taking on a suicide mission that may kill them all. 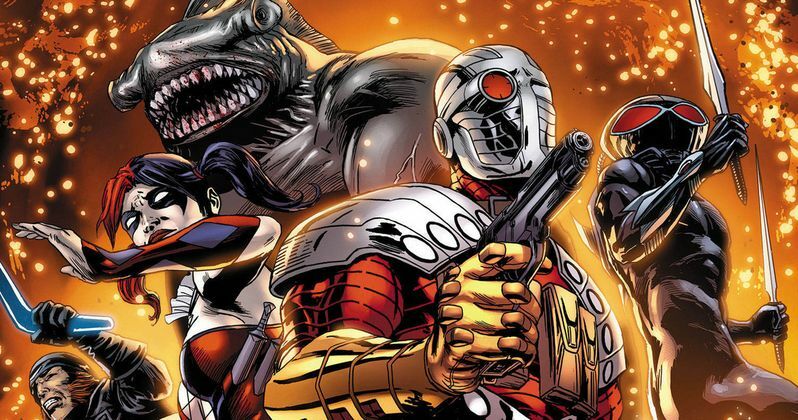 There have been several incarnations of the Suicide Squad in DC Comics, with villains including Captain Boomerang, Deadshot, Bronze Tiger and many more, but it is unclear which characters will be used in the film. The Variety report also reveals that other villains such as The Joker and Lex Luthor may appear in this film, and that there will also be opportunities for Suicide Squad members to cross over into other Warner Bros./DC Comics adaptations. Justin Marks (Top Gun 2, Dead Space, The Jungle Book) is writing the screenplay, with Dan Lin producing. No production schedule was given, and it isn't clear which of the nine DC release dates Warner Bros. is eyeing for this project. David Ayer's next film, the World War II drama Fury, opens in theaters next month. His other directorial credits include Sabotage, End of Watch, Street Kings, Harsh Times, and he also wrote the script for Training Day. The Suicide Squad was recently featured on The CW's TV series Arrow, and in Warner Bros.' recent animated adventure Batman: Assault on Arkham.